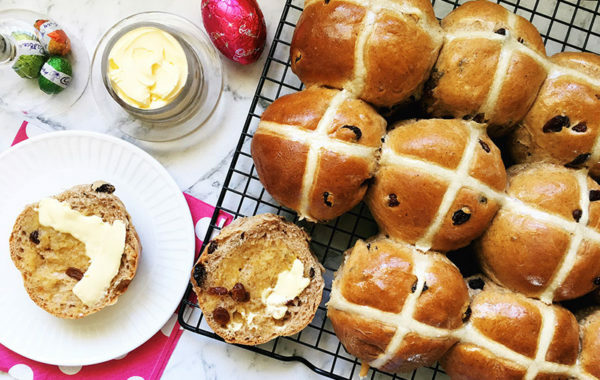 With a family of five, half a dozen hot cross buns don’t go far in my kitchen. 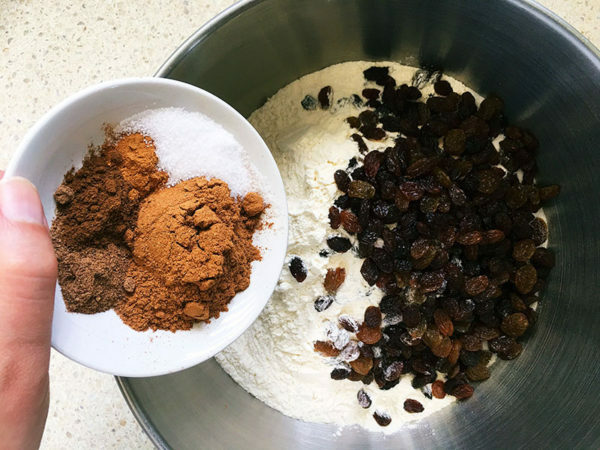 Last year I lost count of how many batches of fruit encrusted buns I churned out – and once you know how, it’s not only super easy, but a real money saver. We’re purists in our family, using fruit the whole way, but if chocolate chip is your preference, swap out the sultanas for some real chocolatey goodness. 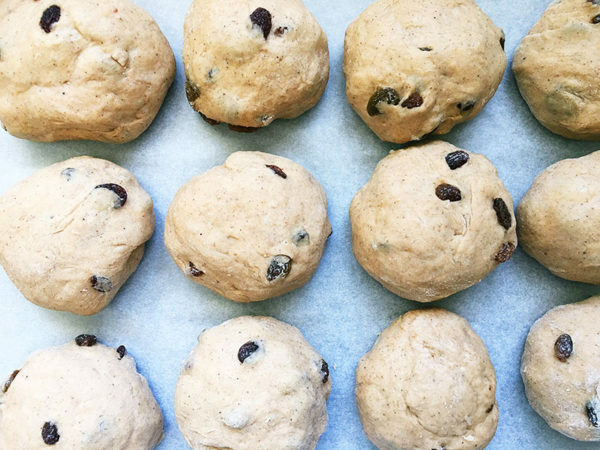 Don’t skimp on the kneading step, you need to really work the dough to have great buns! 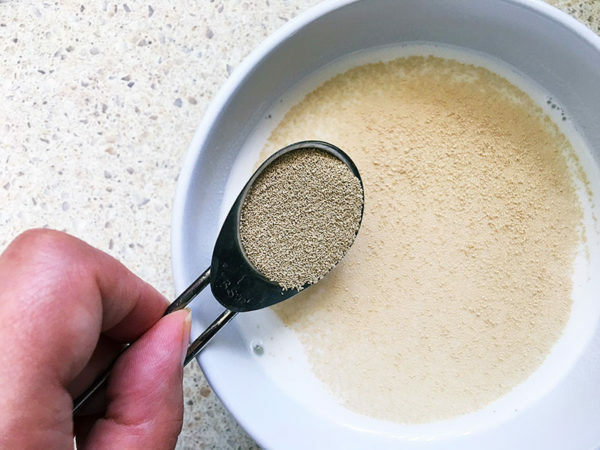 In a small bowl, combine the milk, yeast and 1 tablespoon of the sugar. Set aside in a warm area for 10 minutes or until it’s frothy on the surface. 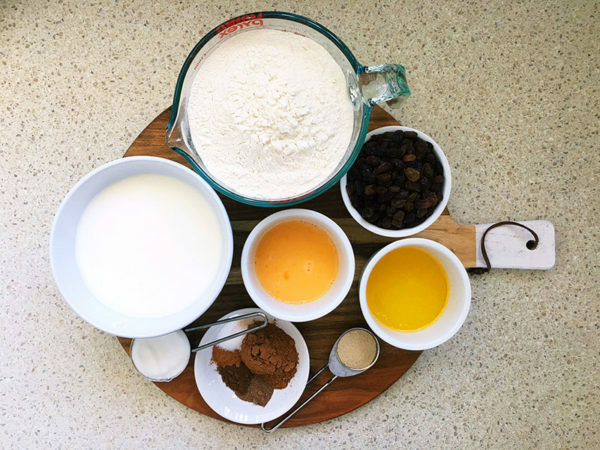 In a mixing bowl combine the flour, salt, spices and remaining sugar. Add the sultanas and mix well. 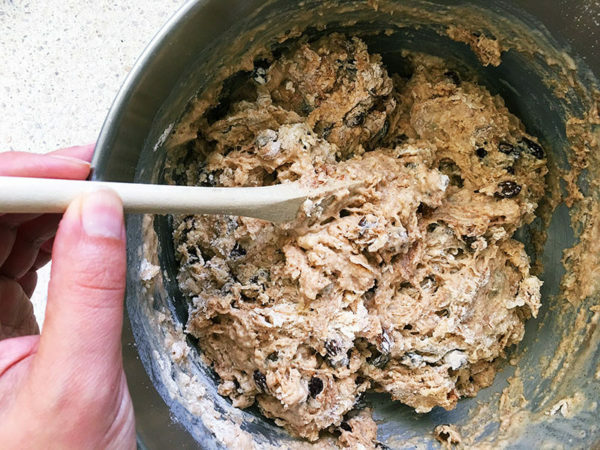 Make a well in the centre, pour the milk mixture in and mix with a wooden spoon until just combined, then use your hands to bring the dough together properly. 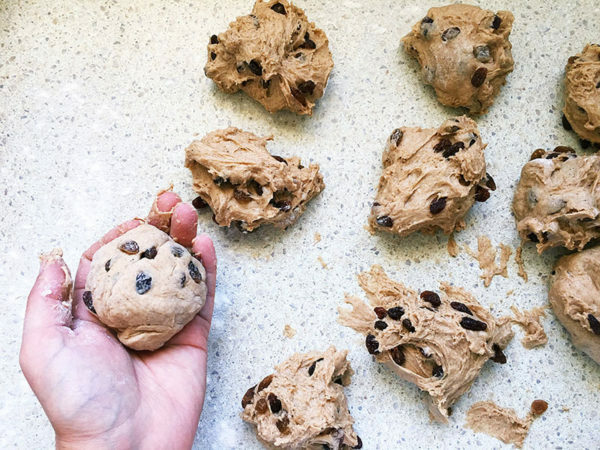 Knead the dough for 10 to 15 minutes until it becomes smooth and stretchy. You can do this with your hands on a lightly floured bench or with dough hooks in an electric stand mixer. Place the dough in a bowl and cover with a damp tea towel. 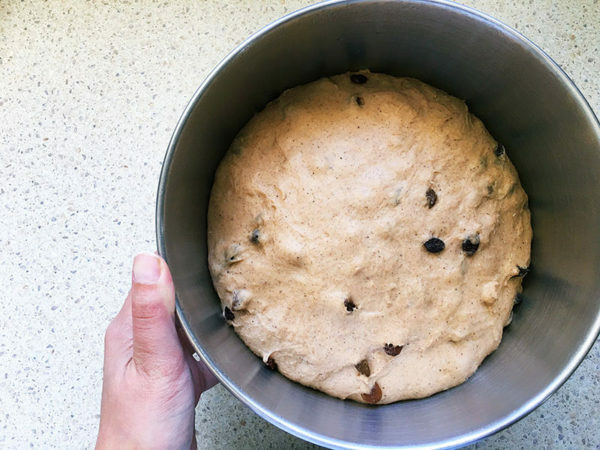 Place in a warm space until the dough doubles in size (about an hour). Preheat the oven to 200°C. Grease and line a baking tray with baking paper. Punch the dough down with your fist and turn it out onto a lightly floured surface. Knead for a couple of minutes and then divide the dough into 15 balls. Arrange the portions on the tray next to each other, leaving a little space between each one. Set back in a warm place for 30 minutes to prove. 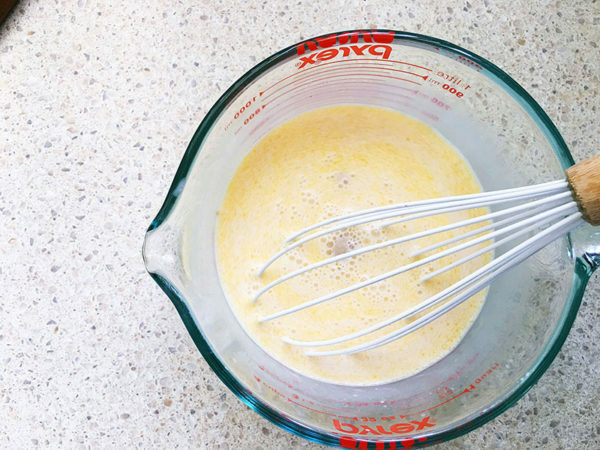 Mix your cross mixture by adding a tablespoon of water to the flour at a time until a smooth, thick paste forms. Spoon the paste into a small zip-lock bag, seal it and snip a small corner in the bottom to act as a piping bag. Pipe crosses on each bun. 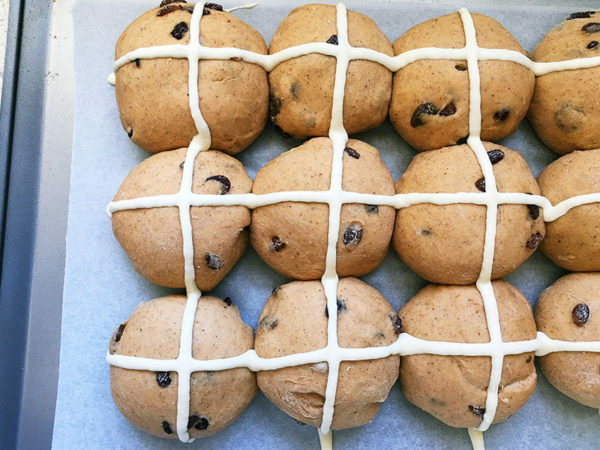 Bake in the preheated oven for 10 minutes, then knock the temperature back to 180°C and bake for a further 20 minutes or until buns are golden brown and cooked through. Turn on to a wire rack. In a microwave, heat the sugar and boiling water in a small heatproof bowl on high for one minute. 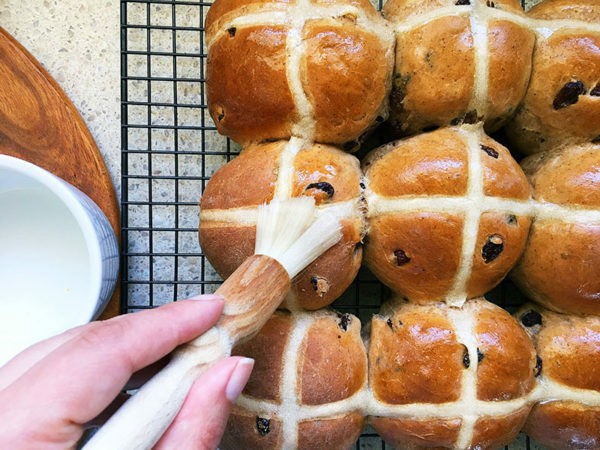 Using a pastry brush, brush the glaze over the buns for a shiny finish. Serve warm with lashings of butter – yum!